Hot Tin Roof - Waterfront Dining at Ocean Key Resort & Spa, Key West, Florida Named for one of Tennessee Williamsâ€™ (a past resident of Key West) most famous plays, Cat on a Hot Tin Roof, this elegant Key West restaurant features a relaxed elegance with dramatic water and sunset views. 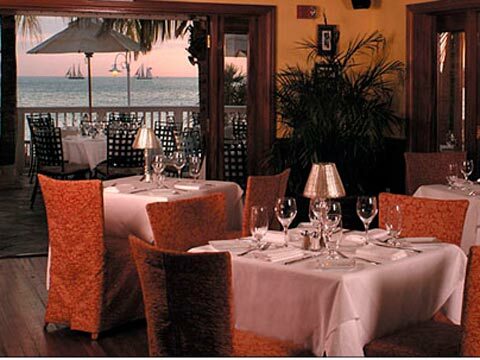 Its menu is highlighted with a mix of seafood and land fare prepared in a unique culinary style dubbed as "conch-fusion," a mÃ©lange of tastes and fragrances, combining traditional Florida foods with Latin, Caribbean and tropical influences. Hot Tin Roof offer waterfront dining and features bright vibrant colors indicative of the overall style of the Ocean Key Resort. The restaurant's 3,000 square feet of dining features indoor seating for 60 and an outdoor deck overlooking Key West Harbor, accommodating up to 40 people. The menu is indicative of the many flavors and influences of South Florida. More than just another Key West seafood restaurant, Hot Tin Roof offers tantalizing appetizers such as: Curried Crab Cakes (with spicy habanero remoulade), Coconut Crusted Shrimp (with orange horseradish, herb and jicama slaw) and Vegetable Spring Rolls (with tropical fruit sweet chili sauce). Main courses include: Hot Tin Paella (with baked saffron rice with lobster tail, shrimp, clams, mussels, chicken and chorizo sausage) and Yellowtail Snapper (pan seared and rubbed with dill chimichurri, served with whipped potatoes and gazpacho salsa). Desserts include: White Chocolate Coconut Banana Cream Pie, Pineapple Upside Down Cake with Cherry Glaze and Tres Leches with Cinnamon Basil. The restaurant's lounge serves a unique selection of themed signature cocktails and is highlighted with a custom-designed mural by Key West artist Jeff Beal. Make reservations directly online or call today to enjoy this unique Key West fine dining experience on your next visit to Ocean Key Resort & Spa.